Can remember really being ready to start the winter hiking season, In the end of my Work season late Fall can be a tiring time. What better than a trip to the Adirondacks to boost one's moral. 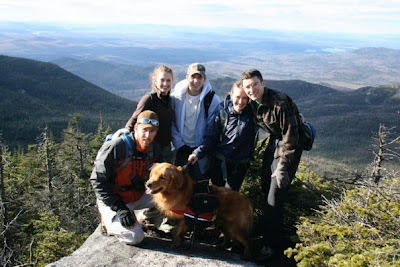 Seth & Jess Burgess, Colleen DeCracker, Terry Monje and I set out for my first Fall Climb. We picked up Colleen & Terry at a car pool stop some where near her collage, don't really think Terry knew what he was getting into although in good spirits. We stopped at Lacie J's Dinner for some Friday fish fry to fuel the up coming marathon march. Later arriving at the Park Motel and Cabin #14 In Tupper Lake around 11:00pm. We unloaded the gear from the truck and tried to settle in with the two beds and a couple air mattresses. The next morning we got a somewhat late start. We arrived at the Corey Road parking area and gear up our full packs for the hike ahead. Along the BlueBerry Foot trail we made our way to the BlueBerry Lean-tos, on the route we met a group of three that stayed at a closer campsite the night earlier. We decided to make a detour to this well maintained site that seemed to be an old horse trail area/stable. After setting up the tents we dawned the day packs and hit the trail. The unmarked herd path Caulkin's Brook ascent would be our choice. We bypassed Seward Mt for a clear shot to Mt. Emmons and then to Mt. Donaldson. While peaking in a timely fashion the decent and lack of daylight seemed to creep up on us. With the sun setting and returning over Emmons we had a quick thought of climbing Seward but that would have been a mistake. The decent was not the most pleasant with headlamps and miles to go our view of the unmarked trail began to fade. We strayed from the path many times and if we didn't have the Mountain Dog Tanner on the team our return would have been delayed quite a bit. 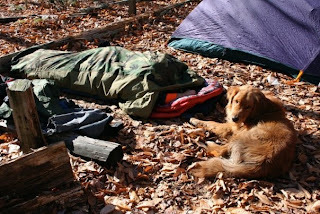 He would wait for his fellow hikers and make clear of the path ahead, thanks to the power of the Canine nose we made it back to our camp site in one piece. Back at the camp site we got the fire burning to warm our bones and try to dry our toes, I made the mistake of placing my socks to close to the fire only to find the remainder of what was my sock. Jess had similar issues with her shoes unfortunately. A quick fix with some ducked tape kept them on her feet for the Hike out. On the menu for this trip were MRE's and Natures Valley bars for the most part and some PB and Bagels. We all settled into the tents and me in my new zero degree sleeping bag and a bivy sack shell. Even with the 24 degree temp I was comfortable outside on the ground. Waking to the morning frost I decided to wait for the thaw before I emerged from my body bag. After some breakfast we packed up and headed back to the Corey Road parking area from another successful trip. I thought that Calkins Brook route was pretty sweet. Soft walking. Glad we took the advice of those other hikers! You inspired me to write up my climbing log from our first Seward Range trip.